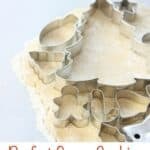 This tutorial answers all your questions about making the how to make the perfect sugar cookies. We talk about how to measure the flour, to how thick to make the dough and tips for baking sugar cookies. I love making sugar cookies, but I have to admit, about half way through decorating them, I’m kinda over it. It’s a lot of work and it’s quite messy. But I still love it. 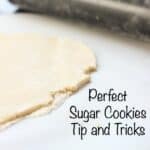 Even though I have gone into great detail about how to make sugar cookies, I am quickly summarizing my 15 Tips and Tricks for Perfect Sugar Cookies. 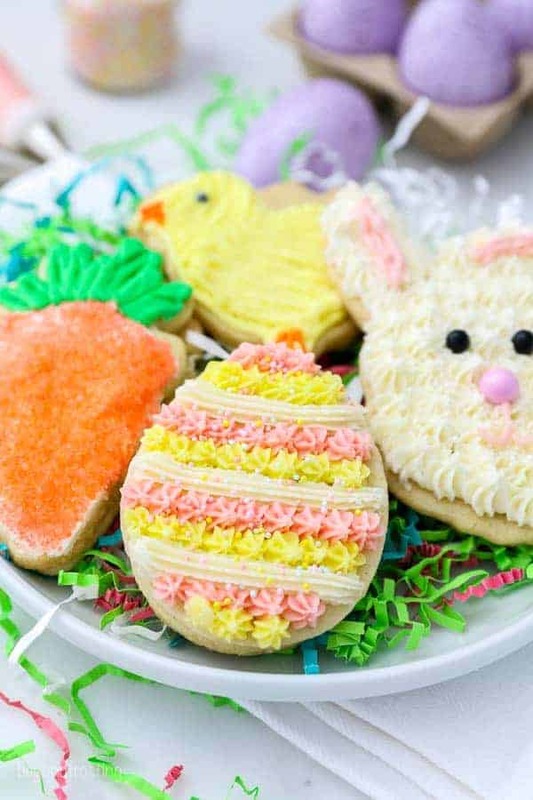 When I was a kid, I looked forward to decorating sugar cookies every year! I helped my mom cut out all the shapes and roll the dough. My brother and I would wait patiently for her to make all the frosting colors and then we would sit down and decorate them together. Let’s be real, the best parts are eating the cookies (or the dough!). 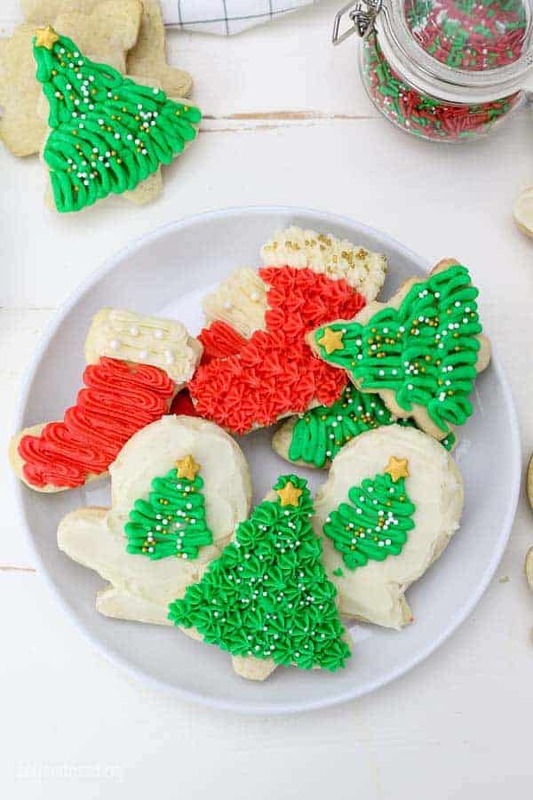 I love the cookies with sprinkles. I know, shocker, right? Almost all of my cookies are decorated with buttercream, I am not really a fan of royal icing, but I do love the look of royal icing. 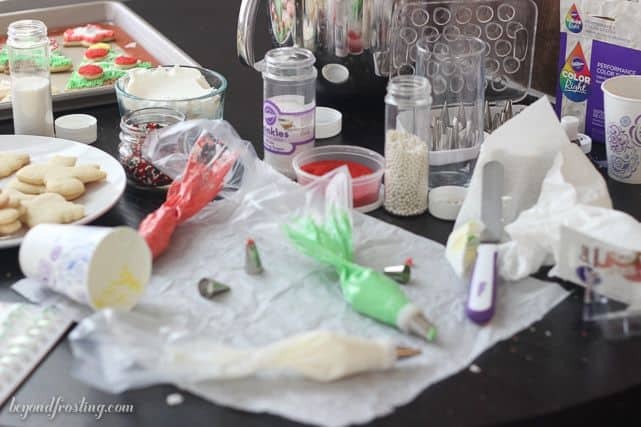 Lucky for you, part two of this post will be some tips and tricks to decorating with buttercream. 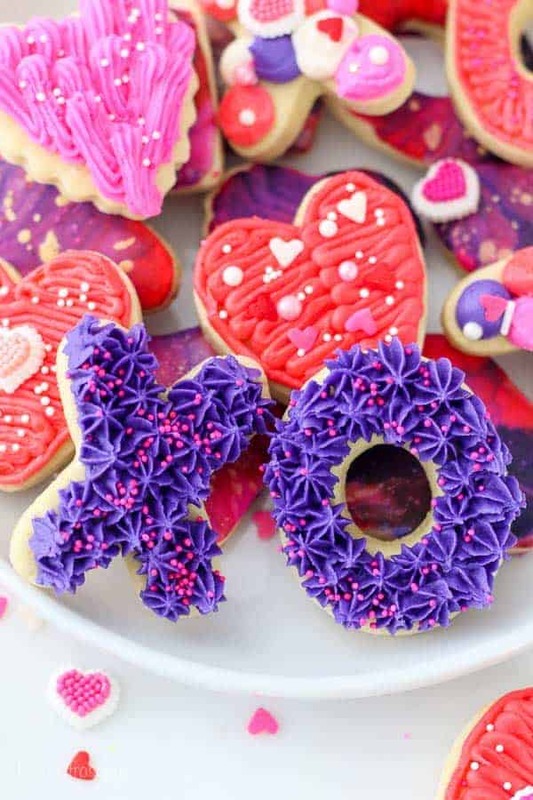 Today let’s talk about Tip and Tricks for Perfect Sugar Cookies. It’s going to be messy. Have a glass of hot chocolate or wine on hand and let’s get through a few of these helpful hints together. Tip #1: Start your dough with cold butter. If your butter is too soft, then your dough will be softer and you will have to refrigerate the dough for longer. I like to take my butter out of the refrigerator and soften it in the microwave for 10-15 seconds max. It takes longer to soften in the mixer, but once you mix it with the sugar, it will be good to go. 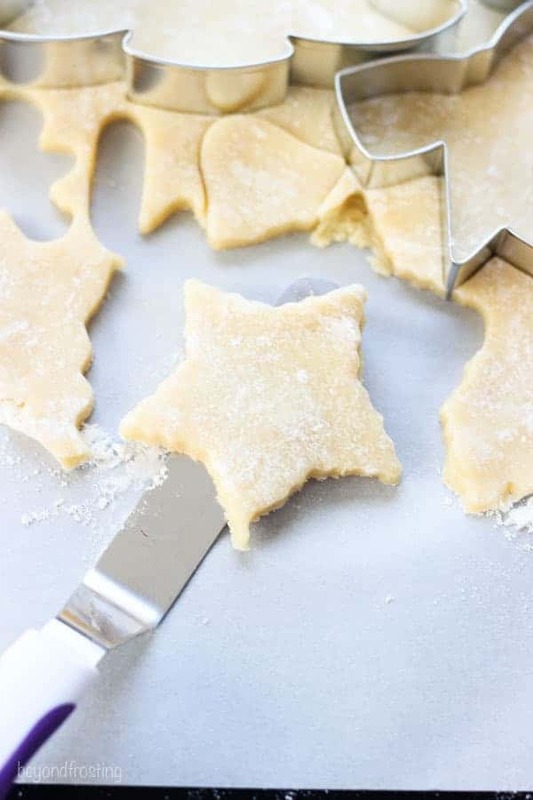 One of the reasons your cookies are too dry or crisp may be because you added too much flour to your dough. I have an inexpensive scale that I use to measure out my flour and my sugar by weight. If you can sift your flour, that’s even better. Tip #3: Don’t over mix! You aren’t making a frosting that needs to be whipped to perfection. Beat your dough at a low-speed until the flour is incorporated. This is a common tip for any baked good. Don’t try to mix in the dry flour at the bottom of the bowl. You don’t need it! Since you will be handling the dough as you roll it out, you don’t want it overworked from the start. It will result it tougher or drier cookies. A good dough needs at least 15 minutes to 1 hour in the refrigerator depending on the recipe. 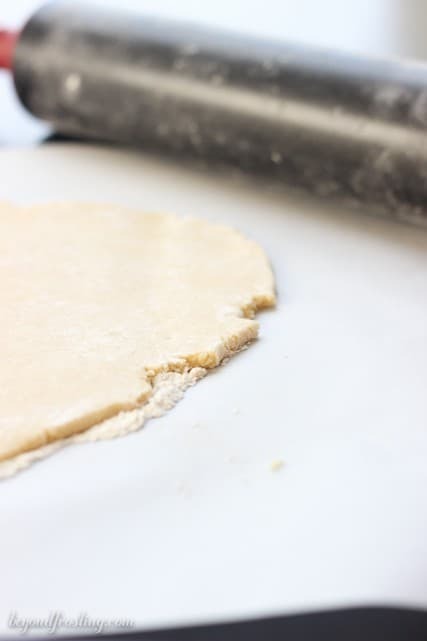 This allows the dough to stiffen, which in turn makes it easier to roll out, just like a pie crust recipe. 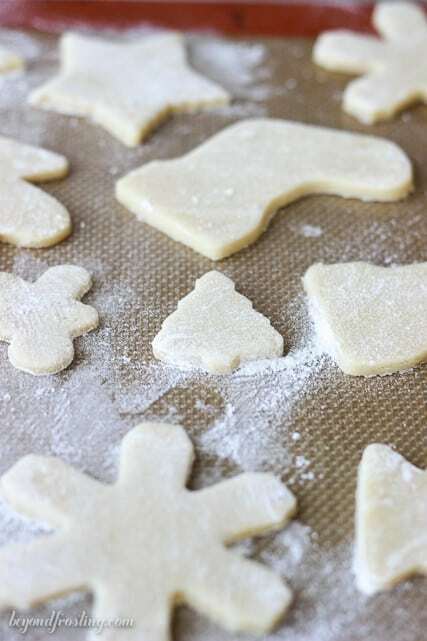 The good thing about sugar cookie dough is that you can actually prepare it in advance and freeze it! This is a huge time saver during the holidays. I always use a silicone baking mat or a large piece of parchment paper (and I tape down the corners). 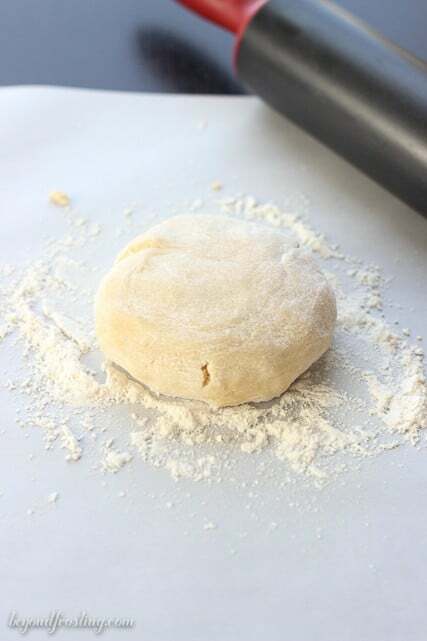 I use a handful of flour on top of the parchment paper, because as your roll out the dough, it will absorb the flour and prevent the dough from sticking to the parchment paper. BUT, after I cut the shapes out and transfer them to a baking sheet, I use a pastry brush to brush away any excess flour. I bake my cookies on a silicone baking mat (preferred) or parchment paper. Your dough may need about 10 minutes to rest after you take it out of the refrigerator. Pack and roll it into a disc. It is always easier when you have a manageable amount of dough. I recommend about a softball size or less. You can roll it out two, maybe three times before it get’s too soft. I treat my cookie dough like I treat a pie crust. Slightly flatten the dough in the center, flip it over and rotate to flatten the other edges and continue this process 2-4 times until the dough starts to thin out. This also allows you to see if you need more flour on the surface. Always roll from the center to edge. Once my dough becomes to soft, after I roll it out 2-3 times, I set any leftover dough aside, and wait until the end to use it again. All those leftover scraps make a lot of good cookies! It just becomes difficult to mix cold dough with soft dough. This one is just for fun. I always say the total yield of my recipe will vary on how much cookie dough I eat. Eat the cookie dough at your own risk, I know some of you are probably thinking I’m crazy, but that’s ok with me. Tip #11: Use your space wisely! 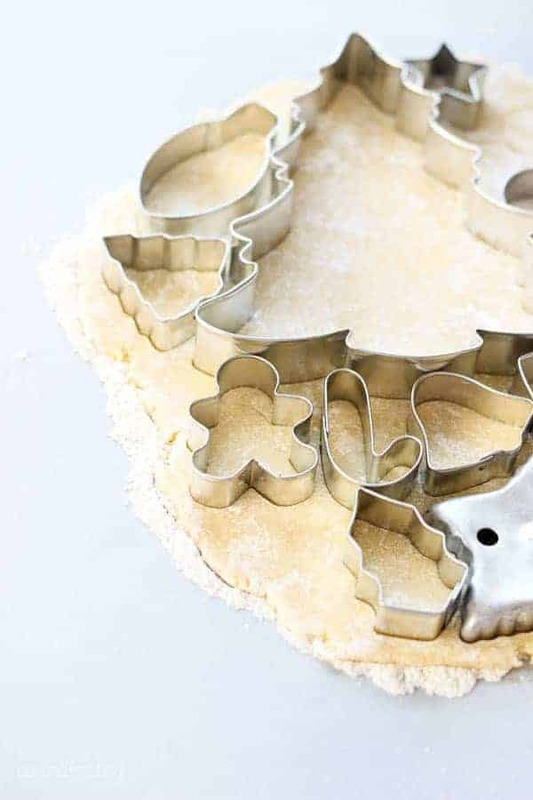 I lay out my cookie cutters over my dough until I don’t have any more room left. I just want to be efficient with my space. I have some mini cookie cutters. I love these mini cookies because when I give away plates of cookies, I use these to fill space, usually unfrosted. Or sometimes I send a little container of frosting a long with it and then it becomes Dunkaroos. Do you remember Dunkaroos? The best. Do you have a cookie that is sticking to the edges? I have seen some people recommend sticking the cookie cutter in flour, but I usually don’t do this. Instead I just give the cutter a gentle wiggle to get the cookie cutter out. If the dough comes out sticking to the cookie cutter, I hold my cookie cutter over my sheet pan and tap my wrist until the dough comes out. If the cookie is ruined, just put it back into your soft dough and re-roll it. I only bake one tray at a time, on the top shelf. If I bake 2 trays at a time, my dough doesn’t bake the same. Yes, it is slower. But we are talking about making perfect cookies right? If the edges of my cookie start to brown, they are over cooked. The recommended baking time on my cookie dough is 10-12 minutes. I always bake it for 9 minutes, because as the cookie cools, it is still sitting on a hot pan. Once one pan goes in the oven, I have another one ready to go. Always keep it moving. It does help things go faster. Once my cookies are completely cooled, I freeze them on a sheet pan, and once frozen, I transfer them to a freezer-safe container. When I want to pull some out to frost and serve, I thaw them flat on a baking sheet. Now I would love to hear from you! What are some tips and tricks that work for you?? 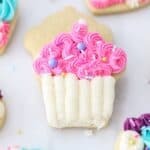 Tips for Decorating Sugar Cookies with Buttercream Frosting! Hello do u hv a shortbread recipe to share please. Hi Vimla, sorry I do not! I live st 8700 feet above sea level and have trouble with my cutout cookies spreading so much I can’t tell what it is. Help! I read it might be that I use all butter? Hi Nancy, my mom who has been making this recipe all my life tried that this year and had issues with DRY cookies at 8500 ft. Brittle. I have no ides how to fix it unfortunately because I am not with high altitude baking. I am sorry! Bev! This is great advice, thank you for jumping in!! In the last few years my mom has moved to the mountains of Colorado and she often shares her baking struggles with me. 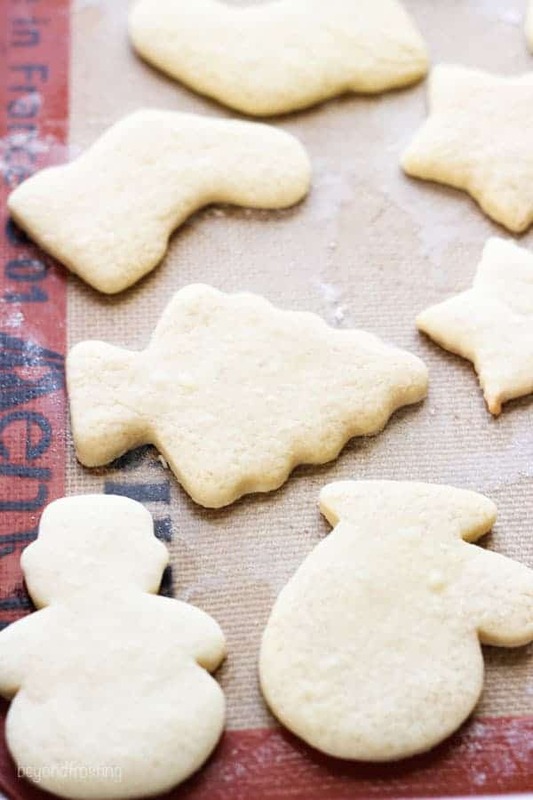 After living in Vermont for so many years, she’s trying to figure out the adjustments needed to bake her favorite recipes like these sugar cookies. Thanks for jumping in! Cannot find my 60’s sugar cookie recipe and stumbled upon yours. And the tips are great, even tho I have been making cutout cookies for 55 years Whoa!!! I have some of the same cutters as you..Happy cookie making and Holidays to all…Today I am making my Halloween cookies…such fun, due to fact I had unexpected heart attack 3 months ago….. I have been wanting to improve my baking skills for a long time. Sugar cookies seem like a good place to start. I liked that you pointed out that when rolling out the dough you should flour the area well. That is good for me to know when making the cookie. Now I just need to find a really good recipe to try. 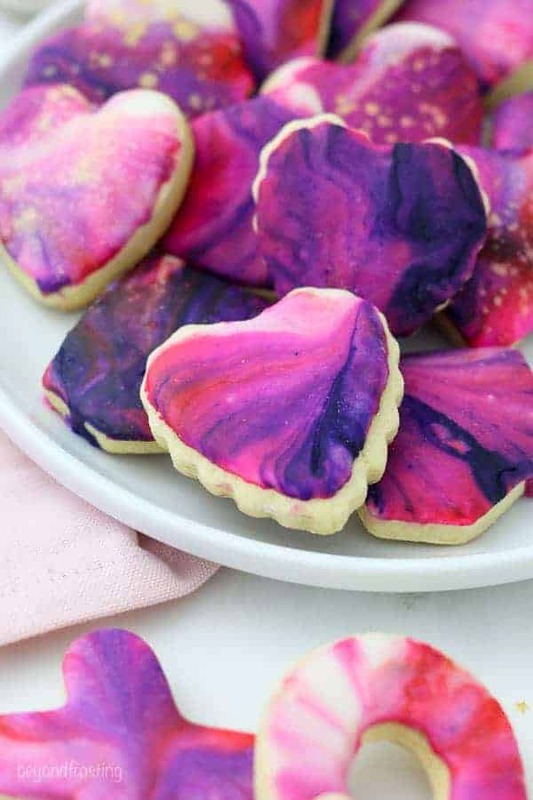 These are amazing tips — and beautiful cookies! There are so many great tips here! 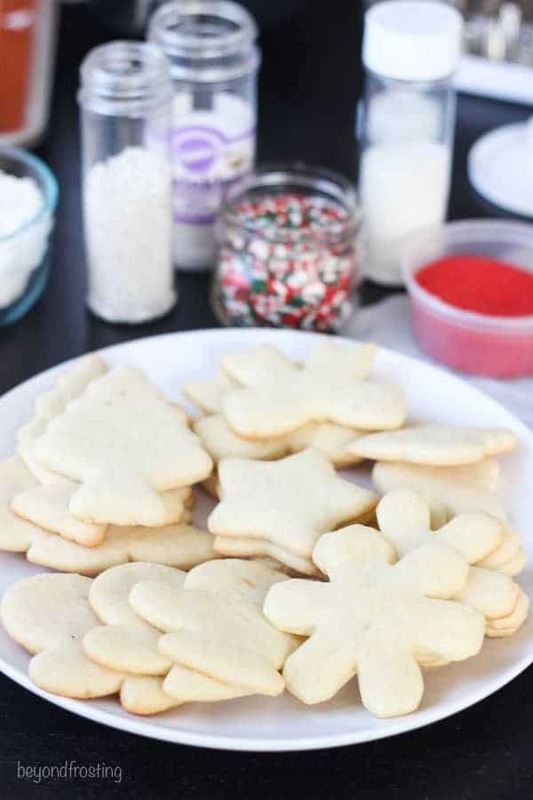 The kids and I love to make sugar cookies at Christmas, and this is definitely going to help!